It's healthy food; it adds to consumer demand and gives fishermen more options when they're fishing; and it introduces students to new species. 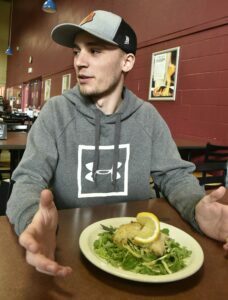 FARMINGTON — Joseph Romine sat down for lunch on a recent afternoon with a plate of arugula and spicy greens, zucchini noodles, burst grape tomatoes and a delicate slice of hake sourced from the Gulf of Maine and served with a spiral of lemon on top. 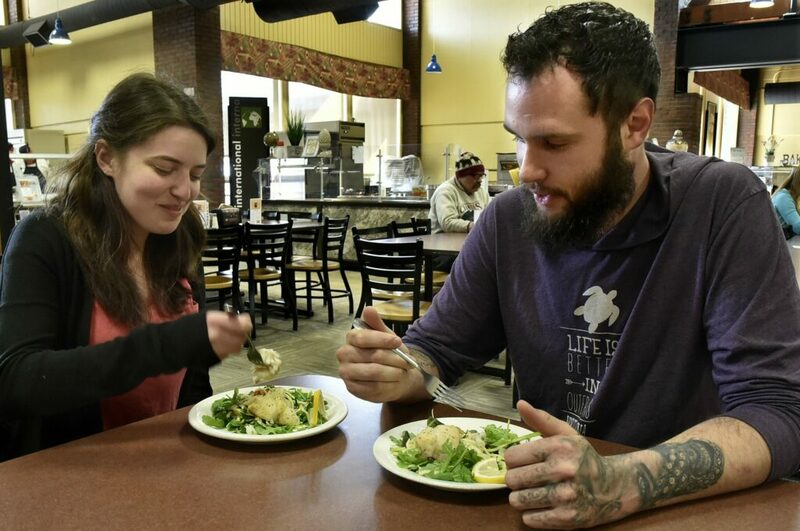 The lunch is nothing out of the ordinary for students at the University of Maine at Farmington’s dining halls, where 100 percent of the white fish served is sourced locally from the Gulf of Maine. Lately, there have been lots of options, from the sauteed hake to fried pollock to sand shark bites reminiscent of chicken nuggets. For the last three years, the campus and others across Maine have been pushing to incorporate more local foods, and especially more local seafood, in an effort to help the local economy and reduce the university’s environmental footprint. 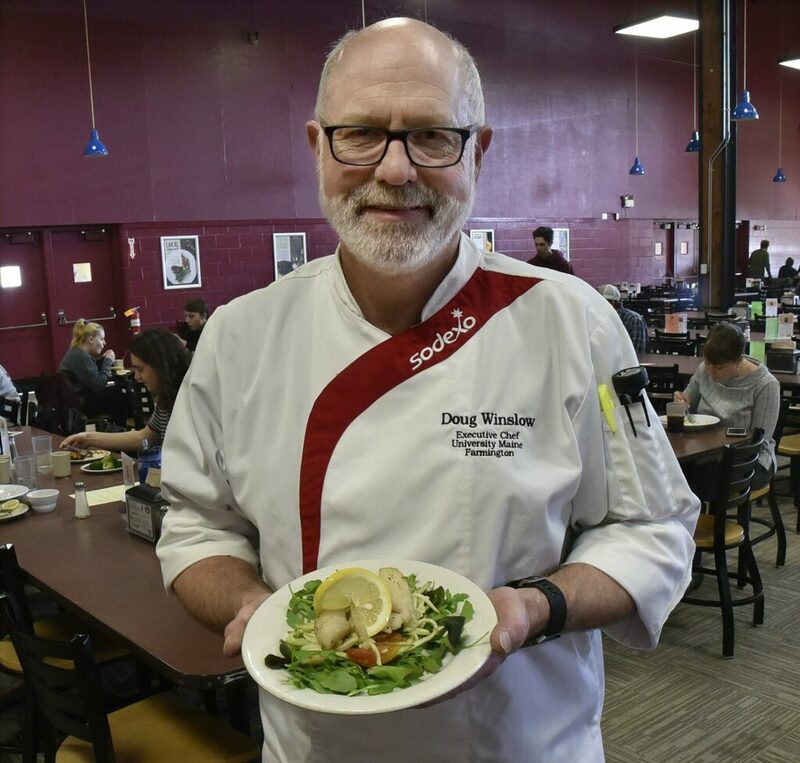 “If you’d have told me when we started I’d be selling 40 pounds of hake per week to a student population I would say that’s crazy,” said Doug Winslow, executive chef at the University of Maine at Farmington. 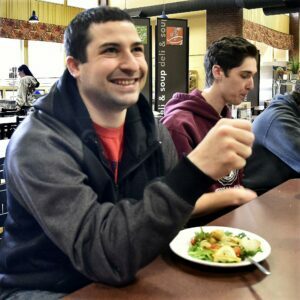 In 2016, when the University of Maine system entered into a five-year contract with Sodexo, the university pledged to commit to locally sourcing 20 percent of food served at its campuses in Augusta, Farmington, Fort Kent, Machias, Presque Isle and the University of Southern Maine by 2020. Winslow said UMF has already exceeded that goal and is currently sourcing 25 percent of its food locally, defined as in a 175-mile radius of any University of Maine campuses. Through Sodexo, UMF enrolled in a program called The Maine Course, a statewide initiative to prioritize serving local and sustainably harvested food at all of the company’s client sites in Maine. Part of the program includes a goal to get all 13 campuses Sodexo operates at in Maine to source 100 percent of their white fish from the Gulf of Maine Research Institute’s Responsibly Harvested program. The program looks at federal fishing regulations, fisheries management and science to identify fisheries managed in a way that contributes to their long-term health in the Gulf of Maine region, spanning from Nova Scotia to Cape Cod. Kyle Foley, sustainable seafood program manager for the Gulf of Maine Institute, said programs like Sodexo’s are more rare than one might think. About 91 percent of fish eaten in the U.S. is imported from other countries, she said. The Gulf of Maine is home to species many American diners are already familiar with, such as lobster, scallops and haddock. It also breeds lesser known fish such as dogfish, redfish, white hake and monkfish. Foley said the reason some of those fish aren’t enjoyed as much comes down simply to what people are used to. Some of those species, such as dogfish, are more popular in markets overseas, so many Maine fishermen end up exporting what they catch, even though foreign markets can be less stable. Encouraging more people to branch out and eat a variety of locally caught species helps add to demand domestically and gives fishermen more of a range when they go out to fish, Foley said. She said the impacts of local sourcing by UMF and Sodexo are threefold: It’s local, healthy food for students; it adds to consumer demand and gives fishermen more options when they’re fishing; and it introduces students to new species, hopefully helping to foster a new generation of shoppers and diners who will eat and purchase fish from the Gulf of Maine. As he enjoyed a plate of Gulf of Maine hake for lunch, he said he hasn’t tried any seafood he hasn’t liked.